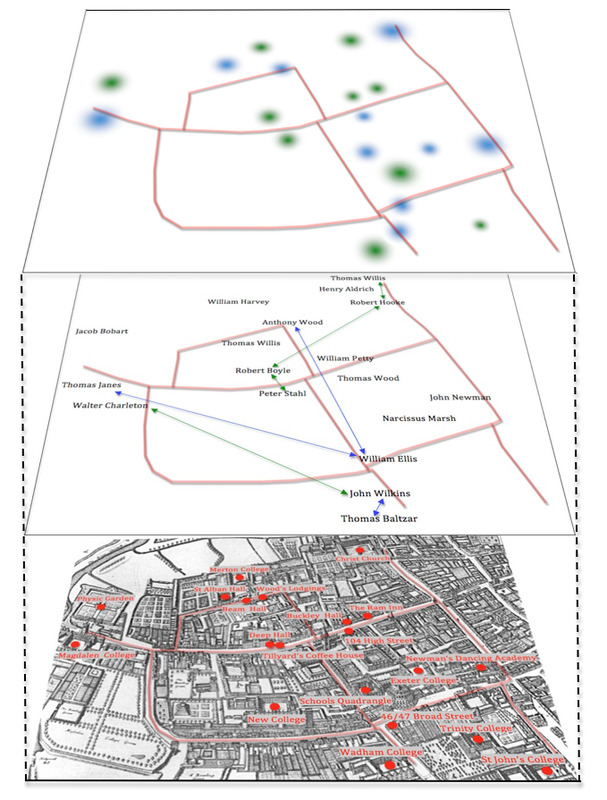 There's more to maps than just finding your way from A to B, in fact almost anything can be mapped if it's possible to envisage identities and connections. I had a sense of this during some work at Farnborough when I was trying to answer the question, 'Can Improvement be Fun ?' 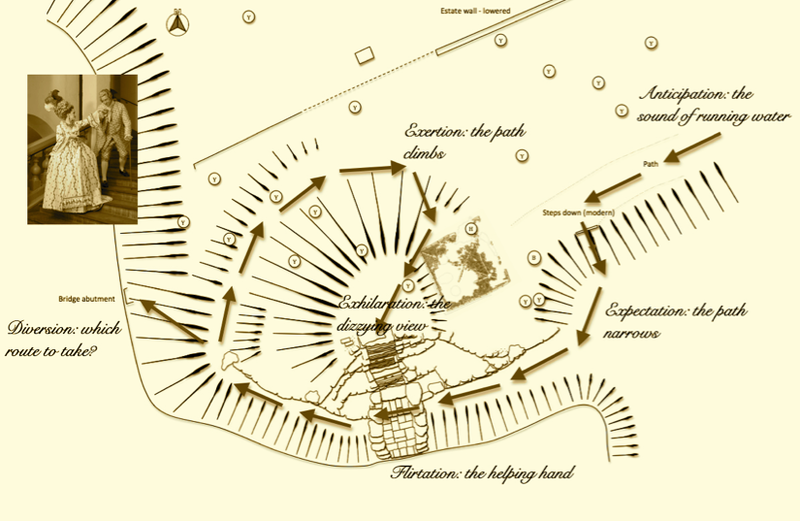 A gloss was added to the plan of the Cascade and the associated features. Partly, OK largely, tongue-in-cheek I wanted to express one extremely speculative view of how the complex could have been experienced by an eighteenth-century visitor, or rather pair of visitors. 'The Lovers Plashed' - An Eighteenth-Century Comedy of Manners. 'it seems generally taken for granted that the organization and construction of the cognitive world, the realm of ideas, is directly affected by the way that the social and material world is organized and constructed (and vice versa)." (Gouk 1996: 258). Now leaving aside the slightly unsettling phrase, 'it seems generally taken for granted' the rest of it and indeed the whole article makes a lot of sense. In reflecting on Oxford in the the 1650s she notes how musicians and those dedicated to then pursuit of natural science basically hung around together and that the spaces, the activities and the thoughts they shared were interconnected. 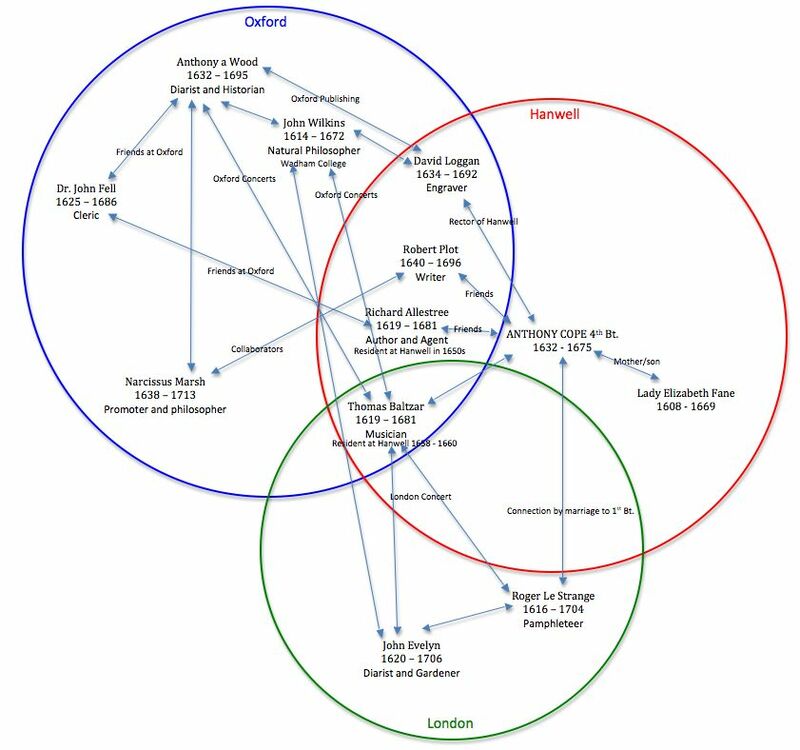 We'll come back to this but my initial thoughts about connectedness at Hanwell began with the Cope family tree, it's useful to have it fairly clear who was related to who and in what order. This started to produce some useful in-sights but I realised that, with particular reference to the fourth Baronet, Sir Anthony - the Virtuoso, family connections would only take you so far. In the late 1650s he was playing host to such extraordinary figures as Thomas Baltzar and Richard Allestree so next up was another kind of map sometimes known, I believe, as a sociogram. Here is an early version. It's quite rudimentary and not particularly tidy but one begins to get a glimpse of who was likely to know who and in what kind of setting. Now modern studies of social networking can achieve all sorts of mathematical wonders and are able to describe any given population using terms such as homophily, multiplexity, reciprocity and propinquity. This all is based on an assumption that one has a fairly complete picture of the entire network, a situation which is unlikely to hold true in an historical context. Even so I'm sure it is an area which would merit further study... we'll see. So back in Oxford we could in theory map the built environment, the related social networks and the conceptual framework and superimpose them and it would look something like this. Multi-layered Oxford, science and music in the seventeenth century. I've only put in a fraction of the social links in the middle portion of the map, there are lots more and I guess that everyone knew everyone else to a certain extent but more research would enable us to characterise the nature and strength of particular relationships. In the top map the coloured blobs indicate areas of intellectual activity; green for science and blue for music. I'm not really sure what this amounts to at present, at the moment it's little more than an interesting exercise.... all ideas and comments gratefully received.